Display ads were 11% less viewable in a year-over-year comparison reports Integral Ad Science in their Q2 2015 Media Quality Report. The viewability measure for display dropped from 49.4% in 2Q 2014 to 44% in Q2 2015. In fact, publisher sites decreased their viewability rate from 55.5% to 50.1% as did ad networks and exchanges from 45% to 39.9%. During the same quarter fraud decreased to 14.1% from 16.5% in Q1 2015. Publishers fared better with fraudulent impressions at 3.7% where ad networks and exchanges had close to 4 times more fraudulent traffic at 14.1%. 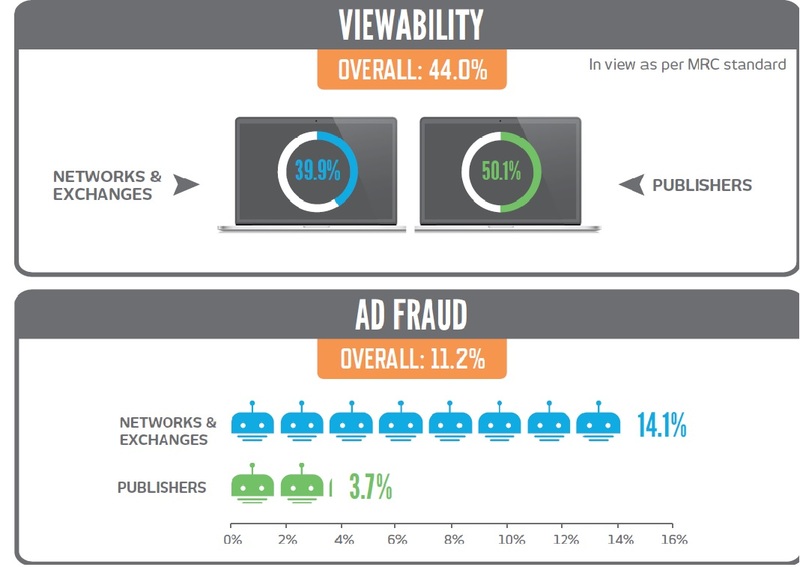 Overall video ads perform better than display in both viewability (37.2%) and fraud rates (11.6%) in Q2 2105. While the industry has made improvements in non-human fraudulent traffic, it’s slow to improve in viewability. Integral also offers the “TRue Advertising Quality (TRAQ)” score using a mix of metrics including fraud, viewability, ad clutter, brand safety and professionalism. Display averaged a score of 604 on a scale of 1,000 with publishers scoring a 656 and ad networks and exchanges scoring a 584.